Turmeric is getting a lot of media attention at the moment but it also gets great results. Many of our customers take a turmeric supplement to assist with joint health issues and find it beneficial. Turmeric is a strong anti-inflammatory and can be taken as a supplement or used within your diet. For example, it can be mixed with black pepper and coconut milk. It requires the combination of black pepper and the oil from the coconut milk to increase absorption. Turmeric is a very popular supplement with our customers. Another important supplement for joint health is glucosamine sulphate. A lot of our customers take this supplement to help reduce pain and to slow the destruction of the cartilage so that their joints are not degrading any further. Topical applications are also available such as glucosamine and chondroitin gel, green lipped mussel extract gel and arnica balm. These are also effective in naturally combating joint pain and enable you to target specific areas. Other popular options include boswellia and devil’s claw. Omega-3 fish oils are another excellent support for joint health. Fish oils can help with pain, inflammation and flexibility. A fish oil supplement is a great health all-rounder as it’s also beneficial for heart and skin health. If you can’t take a fish oil supplement, there are other oil blends available which are suitable for vegetarians and vegans. For example, a linseed oil blend would be a good alternative. Magnesium is another good option. People with joint issues often experience muscle tightness around the affected area because they tend to hold themselves differently in an attempt to try and counteract any pain or discomfort. Magnesium can help everything to relax. In addition to a tablet supplement, magnesium flakes and topical oil sprays are available. You also have the option of powdered magnesium that can be made into a drink. Magnesium is quite a big supplement in tablet form so if you have difficulty swallowing or would prefer a more convenient option, these are equally effective. Making some tweaks to your diet can also be beneficial for your joints. Eating more oily fish such as sardines, salmon, anchovies and mackerel and upping your intake of green leafy vegetables such as watercress, spinach, lettuce and kale can help. Additionally, sunflower seeds, pumpkin seeds and sesame seeds are great to add to meals to boost your intake of healthy fats. Eating more of fruits such as papaya and pineapple can also be good for you as these have a strong anti-inflammatory effect on the body. I would advise eating a little less of nightshade family foods such as potatoes, tomatoes, aubergines and peppers. This is especially advisable for people affected by rheumatoid arthritis. It’s also advisable to monitor your intake of citrus fruits due to their acidity which can cause inflammation. Additionally, eating less processed foods and reducing your intake of salt and red meat is advisable for anyone that has joint health issues. Lastly, gentle exercise can be really beneficial for people experiencing joint issues. Swimming, yoga and t'ai chi are all great options. 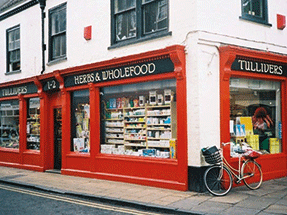 The shop was established in 1983 and moved to its current home in the heart of York city centre in 2000. Tracey and her husband Alan took over ownership of the store at the beginning of April. The store features a herb counter and the loose herb section is very popular with customers. It stocks a wide range of supplements, whole foods, free-from products and organic bodycare. In addition, the store packs its own dried fruit, nuts, seeds and grains. Earlier this year, the store was crowned Better Retailing Secret Shopper Winner 2016 from our sister title, Better Retailing. “It was a really lovely surprise,” says Tracey.